This model is available as an automated tutorial by selecting Model Examples and Tutorials... > Fluid Dynamics > Supersonic Flow over an Obstacle from the File menu. Or alternatively, follow the step-by-step instructions below. Select the Euler Equations physics mode from the Select Physics drop-down menu. Enter -1 into the xmin edit field. Enter 2 into the ymax edit field. Enter 0.5 0.042-(0.5^2/0.042+0.042)/2 into the center edit field. Enter (0.5^2/0.042+0.042)/2 into the xradius edit field. Enter (0.5^2/0.042+0.042)/2 into the yradius edit field. Select R1 and E1 in the geometry object Selection list box. Select Combine Objects... from the Geometry menu. Enter R1 - E1 into the Geometry Formula edit field. Enter 0.05 into the Grid Size edit field. Enter rho0 into the Initial condition for rho edit field. Enter u0 into the Initial condition for u edit field. Enter v0 into the Initial condition for v edit field. Enter p0 into the Initial condition for p edit field. Press the Constants Toolbar button, or select the corresponding entry from the Equation menu, to open the Model Constants and Expressions dialog box. Enter the following expressions for the fluid parameters, and inlet velocity. Select Inlet/outlet from the Euler Equations drop-down menu. Enter rho0 into the Density edit field. Enter u0 into the Velocity in x-direction edit field. Enter v0 into the Velocity in y-direction edit field. Enter p0 into the Pressure edit field. Select Neutral/no stress boundary/outlet from the Euler Equations drop-down menu. In the Non-Linear Solver Settings section of the Solver Settings dialog box increase the Maximum non-linear iterations to 50, and decrease the Non-linear relaxation parameter to 0.9, to allow for the non-linear problem to converge. After the problem has been solved FEATool will automatically switch to postprocessing mode and here display the magnitude of the computed velocity field where the shock pattern can easily be seen. Plot the mach number and verify that the minimum and maximum span between Ma = 1 and 1.8. 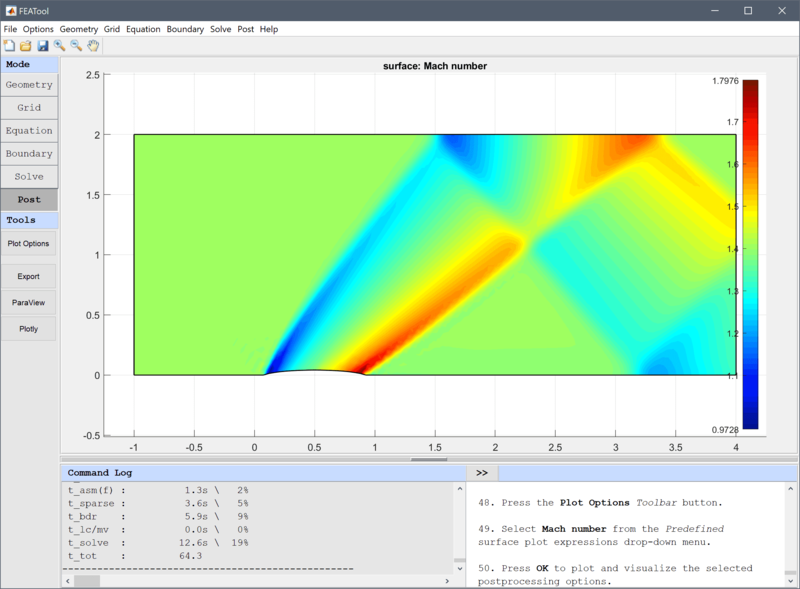 Select Mach number from the Predefined surface plot expressions drop-down menu. The supersonic flow over an obstacle fluid dynamics model has now been completed and can be saved as a binary (.fea) model file, or exported as a programmable MATLAB m-script text file, or GUI script (.fes) file. Lynn JF, van Leer B, Lee D. Multigrid solution of the euler equations with local preconditioning. In Fifteenth International Conference on Numerical Methods in Fluid Dynamics, Lecture Notes in Physics, vol 490, Springer, 1997.